We are so unbelievably thankful for the Adoption & Family Support Center. 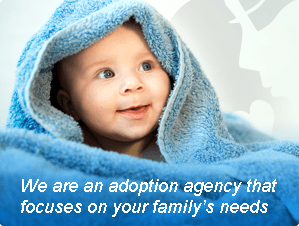 The journey to grow our family through adoption officially began in April 2015 with our home study agency and Christian Adoption Consultants. After completing our home study in one short month, we were ready to be matched! After considering a couple situations, we saw a situation from AFSC that completely caught our attention. After waiting anxiously to hear back, we received a phone call that the expectant mom had chosen us and we were matched with a baby girl due at the beginning of July. To say that we were excited is an understatement! After receiving the call, Caroline ran from her classroom and ran all over campus before getting the gator to drive to find Keith! When we began the process, we never expected to have three months between the time we started the process to the time we were placed. We began preparing for her arrival and looked forward to talking with the expectant mom. Unfortunately, just a couple weeks later, we received a devastating phone call that the mom we were matched with had delivered the baby at some point in the past week and had stopped contacting the agency. We were crushed emotionally and so overwhelmed financially. AFSC never stopped supporting us throughout that time and it was clear that they were hurting for and alongside us. We began to see other situations with growing disappointment and apathy because with each one we felt no connection or desire to present. One Wednesday afternoon, we received an email from our agency that there was another situation that they were working on and that it would be sent out later that day. For some reason, waiting for that situation was different. We waited so anxiously for that email because we “just knew” before we saw it. As we read through the situation, we both became more excited and were absolutely interested in presenting. On July 1st, we received the call that she had chosen us! While there were definitely days of fear that this would turn out similar to the last, we continued to move forward in anticipation. 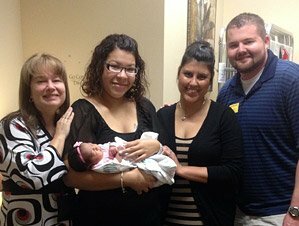 We both had an unexplainable connection with and compassion for this birth mom. On Wednesday, August 12th, as we walked from the pool back to our hotel room, we received a call that a baby girl had been born that morning. We were so excited! On Friday, we received a call from Joanne that we would likely get to meet our sweet baby girl sometime that day. Due to circumstances out of the agency’s control, we had a couple of hours at the hospital with Joanne, Amanda, and Carol Ann. While we would have loved to see sweet Jane as soon as we arrived, we were both so thankful for that time as we were finally able to connect in person with those who were literally making our dreams a reality and who had been able to love on our birth mama when we couldn’t. On Friday evening, we were finally able to see our sweet baby girl, Jane, and she was perfect. We will never forget seeing Joanne wheeled out in a wheelchair, Jane in tow. A few days after, we enjoyed chatting with Edna and Angela in person. Our life has changed dramatically over the past four months and we love our sweet baby Jane. We look forward to watching Jane grow and continuing to develop a relationship with her birth family. We are so grateful to God for this precious gift. Again, we are so unbelievably thankful for this agency and their continued role in our lives. Our biggest regret in the entire process is not living in Florida so that we could stop by with Jane more often!